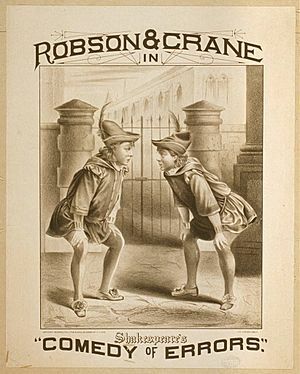 The Comedy of Errors (c. 1589–94) is one of the first plays by William Shakespeare. It is a comedy. Shakespeare's sources were Menaechmi by Plautus and Amphitruo by Plautus. The Comedy of Errors Facts for Kids. Kiddle Encyclopedia.